DONALD BESS, (CCC nickname: “Bessie”) most folks call me Don. My parents homesteaded near Ballantine, MT and I was born in Billings. By rights, I suppose I should claim Montana as my state, but since we moved to Denver in 1922, I have a bumper sticker that says “Native” of Colorado. Things were tough, as all you CCCers remember, even in the Queen City of the Plains. My alma mater is the School of Hard Knocks (colors: black and blue) which I went to till about the 8th grade, then quit to go to work full time. 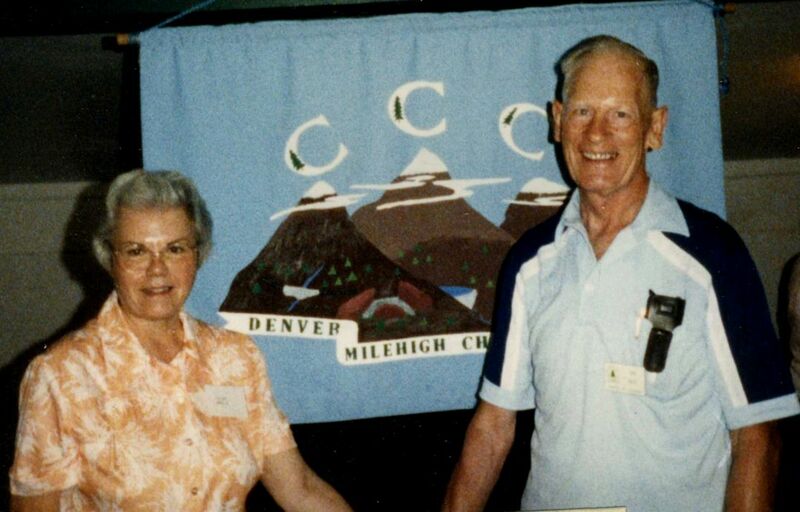 I carried the Denver Post, worked at odd jobs and went up to sign up with the CCCs. They told me to come back in a month and they would let me in. I was 17 the day I went in. Being from Denver I was inducted at Ft Logan, had my physical and got my shots, etc. The next day we took the train to Salida and then the narrow gauge to Telluride on the Galloping Goose to Placerville. I was one of the lucky ones as I got to ride in the cab while most of the guys had to ride in the box car. That should have been enough riding for one day, but we still had 30 to 35 rough miles to go in the back of a stake truck. Finally, we reached our camp at Norwood (Co. 1842, F-48-C) about 35 miles from the Utah Line, elevation 7,017 feet. It was a drought relief camp, and since I did not have any special skills, I was assigned to the road building crew. We pushed the large boulders by hand and foot over the cliff and the grader kept uncovering more. I got muscles but also took sick and had to go to Ft. Logan hospital. After a few days I was OK and asked if I could do something to pass the time. They pointed to a mountain of potatoes—I guess I must have peeled a gillion. The cooks liked me and tried to get me a job as KP at $50 a month and room and board, but the job went to a war veteran. 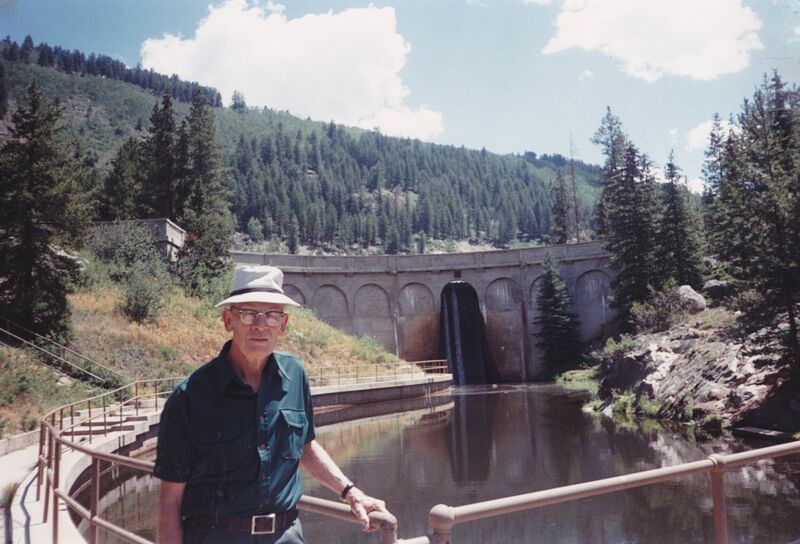 Don Bess at the Chapman Dam he helped build, circa 1980s? I went back to duty at Co. 831 (F-51-C), Meredith, CO, one of the oldest companies in the nation. Our first job was tearing down an old ranger station, and starting a foundation for a new one. At work on the Chapman Dam, we had to shovel gravel, sand and cement into a cement mixer. The mixed cement then went into mining cars, wheeled on the tracks over a trestle, and then dumped into a chute. As the dam began to rise, so did my appetite. That dam is still there. And my appetite is just now beginning to abate. When you go over to Glenwood and to the head waters of the Frying Pan River past Norrie, you can see the Chapman Dam and Campground built there by the CCC. I’m proud of that little project. I know it will last because I helped build it. My next job was interesting. Our crew put up forest service telephone lines. We dug the holes for the poles by hand, set the poles, with some of the poles having to have a guy wire hooked to a “dead man” (a pole buried longways in the ground). We forgot to creosote some of the poles before we had them up, so here we were up on the poles cutting the tops off to creosote them. One day I had climbed one of these poles stringing line when one of my climbers came loose, and there I was hanging by my safety belt upside down, hollering like a wild cat. My tools were all in the river, and to make matters worse, there was my foreman, Mr. Colter, laughing his head off at me. Try it sometime, it’s not the height that gets you, it’s the upside down stuff that hurts. Lucy and Don Bess, Chapter 7 member photos, 1990s. Our work in the Cs was hard for me, but it taught me to get along with all sorts of people. Your buddies’ lives depended on what you did. In April 1944, the sweetheart you know as Lucy Bess became my wedded wife, making my life complete. I’ve been blessed with much in this life, and I am thankful to be an American living in the good old USA. My only wish is that we can keep it that way forever. At least, that’s the way I remember it all. (As told to Chet Nolte). Chapter Eternal: Don Bess left us August 11, 2006, a few years after his beloved Lucy. Named in honor of Alumni Chapter 7, this organization was formed to recognize and celebrate the history and accomplishments of the Civilian Conservation Corps, and later its alumni, in Colorado, and to assist in identifying, conserving, and interpreting the historic and cultural resources associated with their projects, especially Mt. Morrison CCC Camp SP-13. Posted on February 16, 2016, in Meet the Boys. Bookmark the permalink. Leave a comment. Note: Most photos in posts can be enlarged by clicking on them. Before Earth Day, There Was the CCC!